Wordseye is a first-of-its-kind web and mobile application that lets you literally Type a Picture™ using simple language. With Wordseye, you can turn words into art, visual opinion, greetings, cartoons, and and banter with these images on our site and over social media. IS WORDSEYE A SOCIAL NETWORK? WordsEye is a new kind of Social Network for creative expression and "visual banter". Once you create a scene, it can be shared to the WordsEye Gallery or other social networks like Facebook, Twitter, Tumblr and Reddit. But unlike any other form of visual media, Wordseye scenes are infinitely malleable. They can be clicked on, edited with language, seen from a different angle. The ability to quickly create and edit scenes makes communicating and expressing yourself with pictures almost as easy as sending a text message. WordsEye works by parsing text input into a semantic representation which is then rendered as a 3D scene. This process relies on a large database for linguistic and world knowledge about objects, their parts, and their properties. Wordseye is a web application that works in any browser without special software or plugins -- the rendered scene is can be viewed from any angle. A set of 2D filters can be applied to the scene to add a painterly or illustrated look. All computation is done on a scalable cloud infrastructure where scenes are rendered (ray tracing) in near real-time using state-of-the-art GPU hardware. WHAT ARE THE ADVANTAGES OF USING LANGUAGE TO CREATE SCENES? Most 3D graphics authoring systems allow scenes to be created by invoking complicated dialog boxes and directly manipulating the graphical elements. While this provides a high level of control, it can often be a long and tedious process that requires extensive training and artistic skill. As a result, while 3D artists can create almost anything they can imagine, the rest of us are cut off from that experience. By using language, anyone can describe 3D scenes very quickly and easily. WordsEye unlocks and democratizes the incredible power of 3D graphics by making it accessible to everyone. 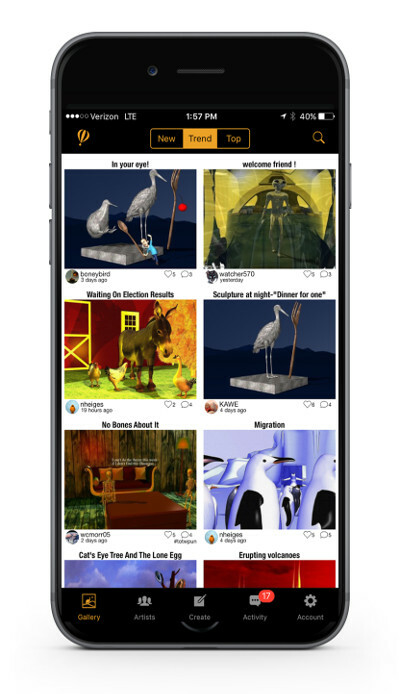 In addition, the rapidity of making scenes with language enables opens up 3D graphics to be used in new contexts for instant messaging and visual banter. Textually generated of senes are also very suited to mobile devices, voice interfaces, and ultimately VR where screen space for graphical GUIs is limited or nonexistent. WHAT OTHER PRACTICAL USES ARE THERE FOR WORDSEYE? Our primary goal is to enable a new form of creative expression to a broad online audience. In the future we see strong applications in education, mobile messaging, VR, and gaming. WHAT ARE EDUCATIONAL USES FOR WORDSEYE? Wordseye gives students the experience of seeing their words spring to life. This has application in ESL, EFL, special needs education (e.g. autism), art instruction, creative writing, and literacy skills education (vocabulary, spelling, size and distance words, etc.). We have formally tested WordsEye in the classroom with 6th grade students. Student pre/post-trial writing samples showed statistically significant growth in writing and literary response for WordsEye group. Students also reported that WordsEye helped them imagine and visualize stories. Top level: Anyone is permitted to use WordsEye scenes for non-commercial purposes only. So if you have a great idea for a game or interactive piece and it is not a commercial product you are good to go. We would ask that you credit WordsEye in the game. Note also, to insure the most creative and interactive use of WordsEye scenes all WordsEye users grant other users and WordsEye a royalty-free, non-exclusive, perpetual, worldwide license, under your intellectual property rights, to copy, reformat, index, modify, display, distribute and put to commercial and other uses the rights to the use your scenes. We are considering options for granting commercial usage rights associated with Wordseye scenes. WHERE DOES WORDSEYE CONTENT COME FROM? We have relationships with 3rd Party content vendors and are creating our own as well. CAN 3D ARTISTS UPLOAD THEIR MODELS TO WORDSEYE? Currently users are able to upload their own photos and use them in their scenes. In the future, we will also allow users to upload their own 3D models into the system. We are discussing a variety of options for this. Please write us at type-a-picture@wordseye.com if you are interested in uploading your 3D models onto the system. We now have a Wordseye mobile app for IOS. It is available in the Apple App Store. WHAT NEWS AND BLOG STORIES HAVE BEEN WRITTEN ABOUT WORDSEYE? CAN I FOLLOW WORDSEYE ON SOCIAL MEDIA? WHO CAN I WRITE TO FOR MORE INFORMATION? Can people see my portfolio? No, users can only see what you publish to the WordsEye Gallery or scenes where you add a permalink. Can people copy my scenes? (Attribution) - how to hide/unhide text? Users have the option to keep their input text private even when sharing a scene itself. Any scene that is posted to the Gallery or made public via a permalink can be copied by other users if the original scene's text is disclosed. When a scene is copied from another scene and then posted to the gallery, the new scene will display a small thumbnail in the bottom right hand corner, showing where it was derived from. This way users are can riff on each others scenes while still crediting the original artist. If you do not want users to open your scene or see your text then you must click the undisclosed option underneath Input text in the Title, effects or share page. Can I use my scenes for commercial use? The Wordseye terms of service currently grants our users the rights only to personal and non-commercial use of their scenes. When do scenes become Trending vs. New vs Top? Scenes are voted up by the star on the right upper corner of the scene viewing page. Trending is determined by a combination of the number of votes and comments a scene has received recently. Top is determined by total number of votes a scene has received. How do weekly challenges work? Every Monday we announce a new theme of the week challenge. These will be announced on the site in the Forum, in our weekly email newsletter, and as a notification when you click on Create. The winner will be announced the following Monday and will win 50 tokens. What happens if I forgot my password or login name? Visual commenting is the ability to riff on an existing scene by opening and modifying it, or by responding with a new scene. Scenes with visual comments are identified in the Gallery with a rainbow colored icon. What are tokens/how does it work? When artists first register for Wordseye, they are given 100 tokens to use to generate High Definition renders of their scenes. Each HD render uses 10 tokens. In the future, tokens may be used to access other premium Wordseye offerings. What is the difference between standard and HD images? A High Definition (HD) image has higher pixel quality than our normal scenes (width of 1248 pixels vs 624 pixels). Can I change in a scene after I've posted it? Yes. At any time, you can change any of the effects that have been applied to a scene. This includes changes to 2D effects (eg Illustration or Watercolor), and as well as Talk and Thought Balloons. You can also change scene properties such as titles, captions, and hashtags. How does Undo and Revert work with 2D effects? Undo will undo the last effect you applied (only one Undo level is available). Revert will remove all effects and restore the image to the original render. How does Undo work with scenes in the Create page? Undo will undo the change you made to your scene, whether by changing the text or changing the camera position or swapping objects. Only one level of undo is available. Using Undo a second time in a row will redo what was just undone. What if WordsEye does not have an object for a word? If WordsEye does not know a word the system it will present a related object. For example, there isn't currently a 3D model of a slug, but it will choose an bug or insect such as snail, tarantula, beetle, mosquito and so on. If the system does not recognize the word at al it will construct a 3D object out of the letters of the word. How to do make a 3D word? To make 3D words users need to put the word in quotation marks. "LOVE" is next to the cat. How can I swap out models in a scene? On the right hand side there are four tabs: Examples, Objects, My images, and Library. Under the Objects tab users can click on any 3D object to swap in another obect. How can I use positions and colors? How can I fit one object inside another? What lighting options do I have?